LevelAc Switches and Control - SL-400-G Series | Texas Valves & Instruments, LLC. 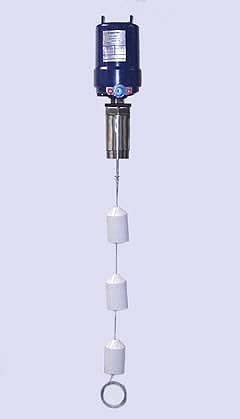 Level Ac displacer type level switches, Model SL-400-G are top mounted and use impervious graphite displacers in the control of liquid level under conditions of turbulence or agitation. Wide adjustable differentials on three mercury type switching stations are obtained by setting position of displacers along stainless steel cable. Spring Retainer: Stainless Steel is standard. Snap Ring: Stainless Steel only. 316 Stainless Steel Bias Spring Housing: 1000 psi @ 100° F ; 800 psi @ 300 ° F.
Differential: Adjustable Variable within cable length, 10 ft. standard. Type: Mercury only, each equipped with one only SPDT mercury switch. Model SL-400 LevelAc level switches use "heavier-than-liquid" displacers which sink below the surface of the liquid under control. Spring suspension balances the normal displacer weight, and as the liquid level rises around the displacer, it is buoyed up by a force equal to the weight of the liquid displaced. The apparent weight loss allows the spring to move the internal armature into the externally mounted switch's magnetic field to produce switch operation.